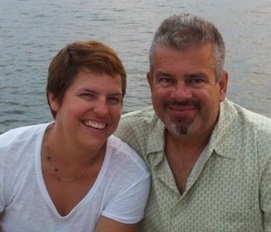 Derrick and I are currently anchored at Playa Santa Barbara in Bahia Conception. Bahia Conception is a huge bay just south of the city of Mulege and is known for being very hot this time of year. We came here to attend Gary the weatherman's annual Fourth of July party. Each morning Gary provides us with a weather forecast on the radio. He is very much loved by the cruising fleet. There were about thirty boats anchored around Gary's home in El Burro Cove. We had a great time meeting people, drinking Pacifico Beer, and eating Gary's hotdogs. The day concluded with an impressive fireworks show thanks to Dan on Dazzler who provided most of the fireworks. Pitt from Karmaseas finished with his " fire twirling, fire eating, fire breathing" show, which is great entertainment - thanks Pitt! We came to this area a little sooner than we had planned so now must hang around before continuing north. This place is quite hot but the scenery, the fishing, and the clamming are great. Derrick has bagged seventeen fish with the spear gun in our first month out and nearly came home with an octopus yesterday (ink was flying). We've received instructions from Mel on Sonrisa, a Tasmanian chef, on how to prepare octopus so we are hoping another opportunity arises. You may have seen Hurricane/Tropical Storm Eric in the news. As we are well up the Baja Pennisula, Eric is hundreds of miles to the south. Our location is seeing clouds and some high winds spinning off from Eric, but we are tucked away safe and sound in a very well protected anchorage. We are thankful to Eric for the breeze and hoping for some rain.